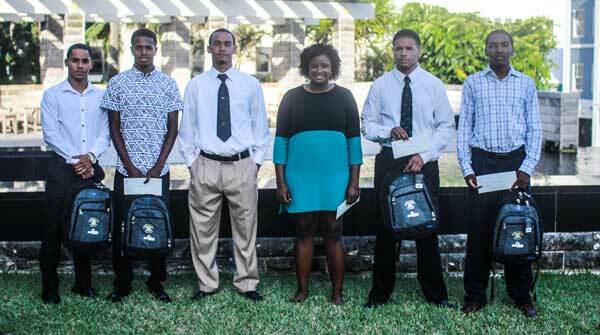 The PHC Foundation held its seventh annual scholarship awards presentation recently at XL Bermuda Limited, O’Hara House, with $30,000 awarded to six young men and women to assist in their studies at prep school, and university. The PHC Foundation has awarded over $150,000 over the last five years, to young people at PHC to assist in their education. Guest speaker for the event was Ms. Kim Wilkerson, Senior Vice President and Assistant General Counsel at XL Bermuda Limited who encouraged the award winners to master their discipline. The awards presentation was also attended by PHC sponsors, Bermuda Healthcare Services and Ultimate Imaging, and family, friends, and guests of the recipients were also in attendance as they celebrated their positive accomplishments. The PHC Foundation was founded in 2005 and its primary objective is to assist young people at the club to pursue higher education. Congratulations to PHC for continuing to set an example regarding higher education. PHC is a shining example of what it means to be a community club. All the best to the scholarship recipients! What a wonderful story to pull up first thing in the day. thus far, put God first and you will all succeed.